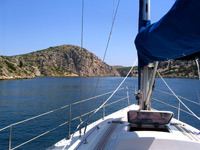 Fantastic Brac Island Sailing offers, Croatia. Fantastic Brac Island Sailing offers. Choose from the following selection of fabulous Brac Island One Day Sailing Trips on board your own private yacht charter. Day Sail from £90 per person. 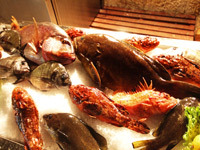 Visit the nearby offshore islands of your choice. Stop by picturesque fishing villages, soak up the special atmosphere of Hvar town or drop anchor and snorkel in some of Croatia’s most beautiful bays. Price includes skipper, lunch with wine and all refreshments throughout your sail. A fabulous day out to complete your stay. Departure is at 10am, Milna Harbour, Brac Island, returning 5pm. Price for 2 persons = £380. Additional Persons charged at an additional £23 per person up to a maximum of 5 persons. 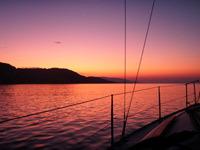 Sunset Sail from £70 per person. This romantic sail starts with an early evening cruise followed by a relaxing swim and snorkel in a secluded bay. Dinner, wine and refreshments included. Departure is at 6pm Milna Harbour, Brac Island, returning half an hour after sunset (9pm-9.30pm). Price for 2 persons = £280. Additional Persons charged at an additional £23 per person up to a maximum of 5 persons. Sail over to Hvar Island and moor in a private bay followed by dinner at Jure’s restaurant for great fish, service and atmosphere. for up to 4 persons = £364. Excludes Fish Dinner. Tailor Made Sailing experiences, birthday / anniversary celebrations also available whether you are looking for one day or one week. For further information please send a request.